Maria Isabel Cintra da Silveira was born in São Paulo in 1965. She graduated from FAAP in 1987 as a Business Administrator specializing in Marketing, before working for three years in the financial markets. In 1989, great inner changes saw Isabel begin a path of studies in search of the necessary knowledge for her transformation and growth. The book Dancing in the Light, written by the actress Shirley MacLaine, was the landmark discovery on her spiritual journey.In 1995 Isabel met the Crystal master, Antonio Duncan. As well as imparting his vast knowledge and expertise, Duncan was responsible for awakening in Isabel her gift of connection with the mineral realm and taught her how to ‘listen’ to crystals. Crystals have since become a means of expression in Isabel’s life, part of her day-to-day activities, both personally and professionally. 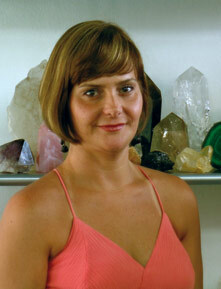 Isabel has developed a singular ability to relate the functions of crystals with themes approached by Radioesthesy, Radionics, Shamanism, Kabbalah and Mythology. Through her work, even abstract theoretical concepts achieve manifest and concrete form through a ‘crystalline embodiment’. The result is an incredibly effective means of assimilating those concepts into our lives, allowing the necessary transformation and growth for our evolutionary process.